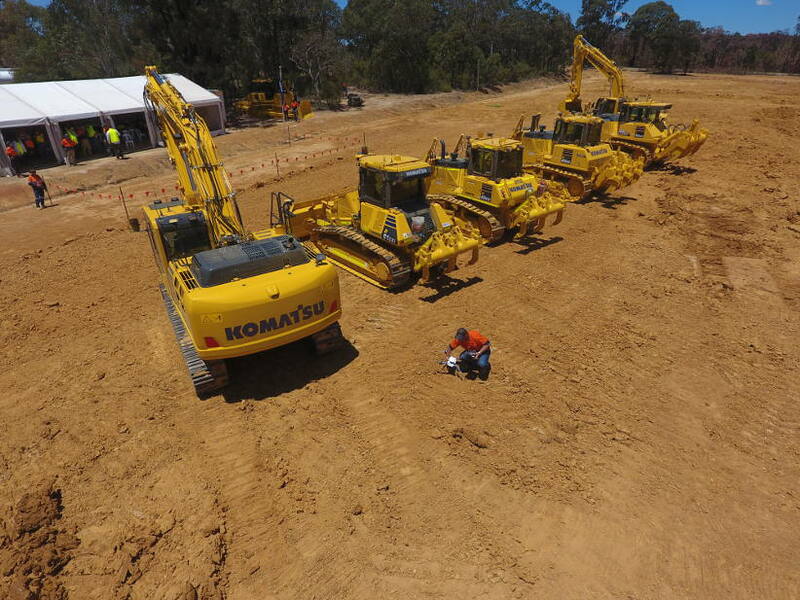 From driverless trucks to drone site surveying, “intelligent” dozers and diggers using advanced integrated technology and cloud-based fleet management, leading mining and earthmoving equipment manufacturer Komatsu Australia is marching ahead with technological innovations tied together under its just-released SMARTCONSTRUCTION concept. SMARTCONSTRUCTION unifies multiple technology platforms to offer a fully integrated end-to-end project management solution that can revolutionise the way construction, mining and quarrying sites are planned and operated across all phases of a project. Komatsu Australia recently launched its SMARTCONSTRUCTION technology concept in Australia and New Zealand and according to National Technology Solution Expert Manager Aaron Marsh, which integrates a host of game-changing technologies for the benefit of its customers. “SMARTCONSTRUCTION truly is the next big step in industry management technology, bringing together some of the key technological developments over the past couple of decades. With these new technologies, we are now able to provide an integrated end-to-end solution for our customers across construction, quarrying and mining,” said Mr Marsh. “It represents a huge advance in how contractors, project owners, quarry operators and miners can design, plan, construct and manage their projects,” said Mr Marsh. To deliver SMARTCONSTRUCTION across the region, Mr Marsh said Komatsu Australia has established a Komatsu Smart Centre, with a team of Komatsu-trained technology solution experts and a national remote support team. “SMARTCONSTRUCTION builds on our industry-leading expertise in machine management through our INSITE fleet management centre, KOMTRAX remote monitoring service, along with our highly innovative iMC – intelligent Machine Control – offerings, which are currently available in dozers and excavators,” he said. “We are building on these technologies with the introduction of our drone-based survey and site management technology and now our cloud-based Komconnect information management offering. He said a key element in ensuring the success of SMARTCONSTRUCTION is delivering the training and support necessary for customers to successfully implement all aspects of SMARTCONSTRUCTION technologies within their operations and projects and that this is provided by a team of Komatsu technology solution experts (TSEs). “Our TSEs will be working across all levels with our customers; owners and management, surveyors, engineers, site project supervisors and managers, operators and maintenance crews,” said Marsh. “We are also providing access to more specialist training, specific site machine solutions and advisory services, for example working with a company called AviAssist to provide UAV training. “In addition, we have a national service and support agreement with the Australian Topcon distributor Position Partners to harness its years of experience in surveying and precision machine control solutions. “These alliances allow us to effectively offer our customers any machine control or site survey solution that’s required for their operations,” he said. SMARTCONSTRUCTION follows Komatsu’s historical trail-blazing into technology-driven innovation in the fields of autonomous (driverless) mining trucks. Its research into these vehicles goes back to the 1980s and it remains the forefront of this technology – a point demonstrated by the highly successful implementation of a fleet of FrontRunner 930E autonomous trucks to haul iron ore for Rio Tinto in Western Australia.